For Music Therapy, Meditation and Stress Relief – Contact Everybody Drum! Please read articles of therapeutic applications in our Common Questions/Benefits to Drum Circles/Articles! My name is Ken Crampton; I have been drumming since the day I was born. It wasn’t until 1986 that I bought my first drum and started collecting drums and percussion. It was then I realized that the music played from our hearts is the orchestra of life! 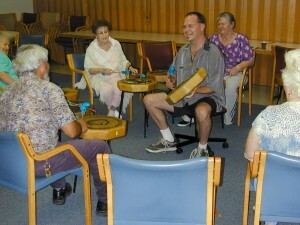 I began holding Community Drum Circles and studying with teachers from other cultures. I spent many years studying, facilitating and teaching throughout the United States. I have seen the rhythms wake dementia patients from their slumber and allow family members to once again commune in communication with family and friends. It has taken the teens angst and turned it to joy! Everybody Drum has joined business individuals in unity through rhythm and the arts. Our programs have been used as icebreakers, community entertainment and for therapeutic purposes. We have helped organizations develop their own programs and assisted them in securing instruments. Our programs can be as colorful as the organizations want from costuming to the performance Everybody Drum offers lasting impressions on the individual and community.